The Windsor Spitfires took a four goal lead in the first period of Thursday night’s game at the WFCU Centre. Ryan Ellis, Alexander Khokhlachev, Jeff Brown and Kenny Ryan each scored a goal to give the Spits the upper hand. In the second period the Spirit’s Josh Shalla scored on the Spits net, while the Spits’ Jake Carrick added another goal for the Spits to make it 5 to 1 at the end of the second. 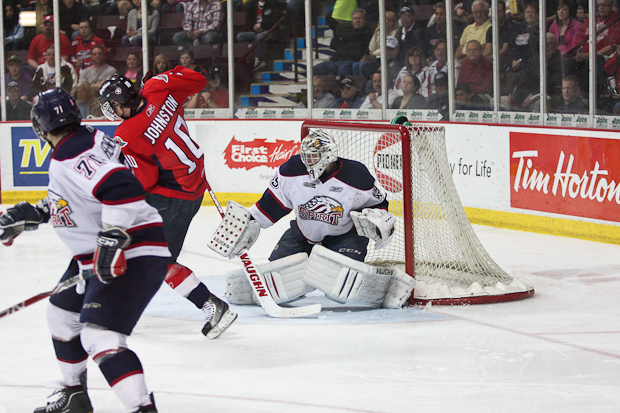 In the third period, the Spirit’s John McFarland scored, followed seconds later by Windsor’s Carrick to give him his second goal of the night. The final score was 6-2 for the Windsor Spitfires! The series is now tied at 2 games each. Game five takes place in Saginaw on Saturday.